If there is one place that is central to much of the excitement in Viti Levu, it's Pacific Harbour. It's not known as "the adventure capital of Fiji" for nothing. While many people still think of, and refer to this area as Pacific Harbour, it has in fact been recently re-branded with a new name. Pacific Coast. This initiative by the Fiji tourism board is part of an overall re-branding strategy. The well known slogan, FIJI ME will no longer be used, Air Pacific will revert back to their old name Air Fiji, along with a host of other changes. But for locals and many repeat visitors, the name Pacific Harbour will likely remain for some time to come. Only a 30 min drive west of Suva (around 3hrs east of Nadi), the area has been growing in leaps and bounds within the Fiji tourism market. That really isn't a big surprise to those that know what this area has to offer. From backpacker to luxury accommodation, and more adrenalin filled activities than you can do in a week. Pacific Harbour - What's On Offer? The main center is to the left of the main road (when driving from Nadi to Suva). You can't miss it. There is a big complex that has restaurants, a supermarket and banks, arts and cultural center, an internet cafe, laundromat, etc. During a recent visit, the weather was less than kind to us. Rainy and poor light conditions (yes, even paradise does get inclement weather sometimes). Not ideal conditions for photography. There is actually a backpackers right in the heart of Pacific Harbour. The name of this place is Tsula Luxury Backpackers, although from reviews that I have read, I'm not entirely sure where the luxury bit comes in. Still, if you are only looking for a place to lay your head at night, this might just be suitable. It's quite cheap, very central with eateries, bars, cafes, supermarket, internet cafe etc only a short stroll away. Do note however, that Pacific Harbour is not right on the beach. You will need to cross the Queens highway and walk another 400 meters to get there. Unfortunately, they don't have a website, so if you book it will need to be through one of the hostel sites. However, from all accounts, it is never even close to full (perhaps that is due to the non beachside location), so you might take a chance and just turn up. Or give them a ring first, their ph is (679) 345 0065. You will find the center in the main part of town, it's impossible to miss. They have a traditional village re-creation in behind the center, where they hold night shows...highly recommended! This area is probably most well known for it's diving opportunities. Just offshore in the Beqa lagoon (pronounced mben-gah), is the island of Beqa, home to Fiji's famous firewalkers. They perform regularly at the cultural cen....oops, I mean the Arts Village. While the astrolabe reef near Kadavu is probably the most well known of Fiji's diving spots, the Beqa area comes pretty close. And one of the most popular dives, is the shark dive. Definitely not for the faint hearted, this is something you will always remember...hand feeding large, wild sharks. The waters around Fiji tend to be clearer during the winter months (or what passes for winter in Fiji) with 100-150' visibility. It's still good at other times, but if you want the absolute best, then consider having your vacation during the months of June-August. A few miles offshore, is the best surfing in the area.... Frigates Passage (a left hand reef break). The only Pacific Harbour resort specialising in surfing and diving, is Waidroka Bay Resort. Rates start at fj$230 pp a night, putting it outside the budget range. However, the location, facilities, range of activities, and experienced staff might make the extra costs worthwhile. This is actually no more than you would pay for a Coral Coast resort like The Naviti, but with superior rooms/bures, and access to much better diving and surfing. The boat leaves from the Pearl Resort at Pacific Harbour at 9am for a fantastic 2 hour snorkelling trip. 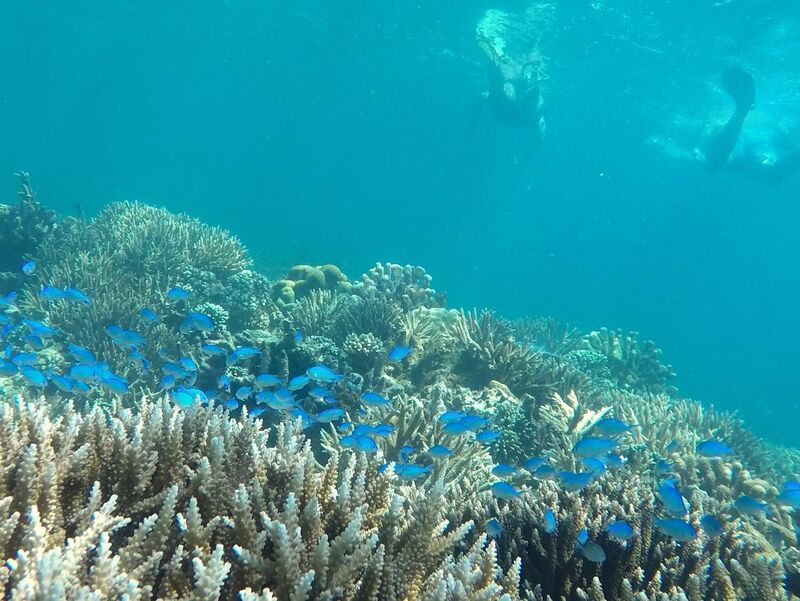 So many pretty fish and coral to see on this reef. As I get sweaty palms standing on a chair to change a light bulb, this really isn't for me. And it's just a bit on the pricey side as well. But if a bit of "soft adventure" and excitement is your thing, and you're okay with heights, then perhaps think about giving this a try. Excellent trip up the Navua River which is technically not at Pacific Harbour, but close. 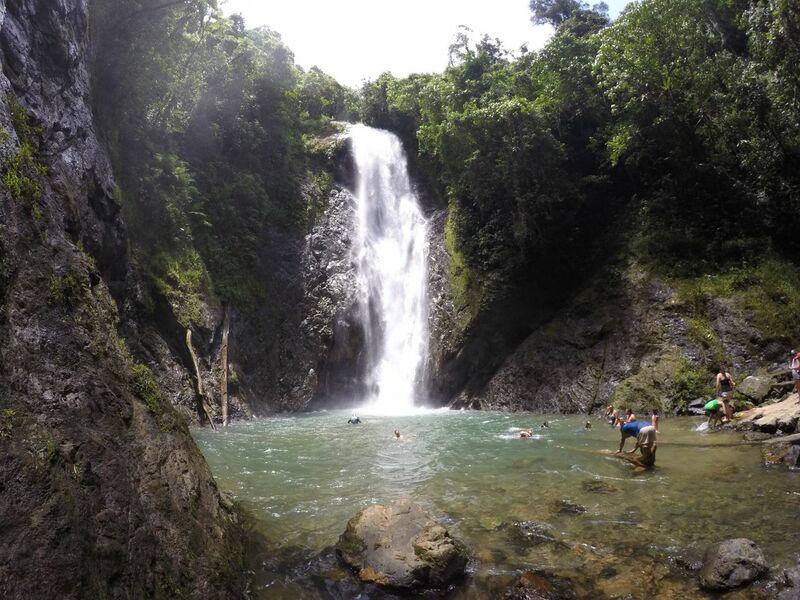 Enjoy river boat ride, magnificent waterfall, local Fiji village and more. 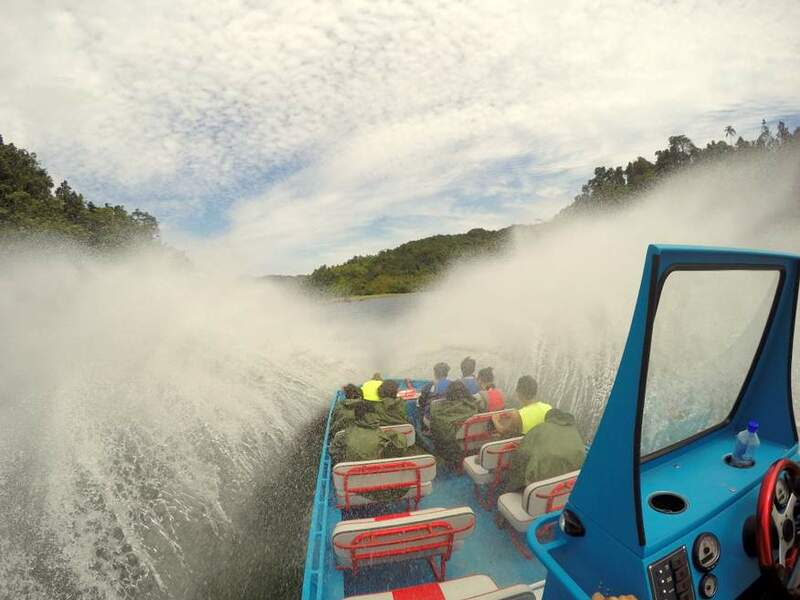 On the same Navua River, instead of the slower long boat up the river, you'll get to speed up there in a jet boat. Walk to the waterfall for swimming, then onto the village for lunch.